To be called merely a “sociologist’ probably would have offended Max Weber. Not that he disliked the study of society; in fact, he spent most of his life doing just that ButWeber’s contribution to understanding humanity is so broad and rich that no single discipline can claim him. Born to a prosperous German family, Weber completed law school and set off on a legal career. But he soon felt confined by the work of a lawyer. Continuing his studies, he became a college professor. With his curiosity racing across the entire human condition, he compiled an amazing legacy of scholarship. The influence of Weber’s parents stands out in his work. His mother’s devout Calvinism probably encouraged Weber’s study of world religions and his classic study of Calvinism and its impact on industrial capitalism, which we take up shortly. From his father, a notable politician, Weber clearly gained insights into the workings of political life and bureaucracy. Weber flirted with politics, and his wife Marianne was a leading feminist of her time. But Weber found politics to be incompatible with scholarly work. The former, he claimed, demands action and personal conviction, while the latter requires impartiality and patient reflection. 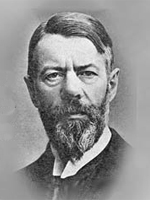 Weber tried to resolve this personal dilemma by urging his colleagues to become involved in politics outside the classroom while striving for scientific neutrality in their professional work. For many reasons, Weber’s life was far from happy. He did not get on well with his father, and soon after his father’s death Weber began to suffer from psychological problems. Illness sharply limited his ability to work during the remainder of his life. Even so, the exceptional number of major studies he conducted has led many to regard him as the most brilliant sociologist in history.